On October, 2 in Inform Agency UNIAN (Kiev) the Round Table“Post service market for the main business branches: situation and development prospects” was held. It was organized by Strategic Communication Company Publicity Creating. Post market experts told about market last trends, and also about post services for financial, media and other businesses, Internet-shops and remote trading companies. Round Table Speakers were: Vladimir Astapenko, “Urkposhta” deputy director,Ludmila Silantieva, VPS Company director, Elena Petina, VPS Company commercial department head, and also Irina Lenio, DM-projects and programs manager, direct marketing expert. Experts told about cardinal changes on the post service market for last 20 years. Only in the middle of 90-th the main post clients were physical persons, but now post working in B2B sector more and making business correspondence, securities, agreements, financial documents etc. delivering. Today post service is the most demanded by remote trading companies, financial establishments, media, advertising agencies, mobile providers and others. 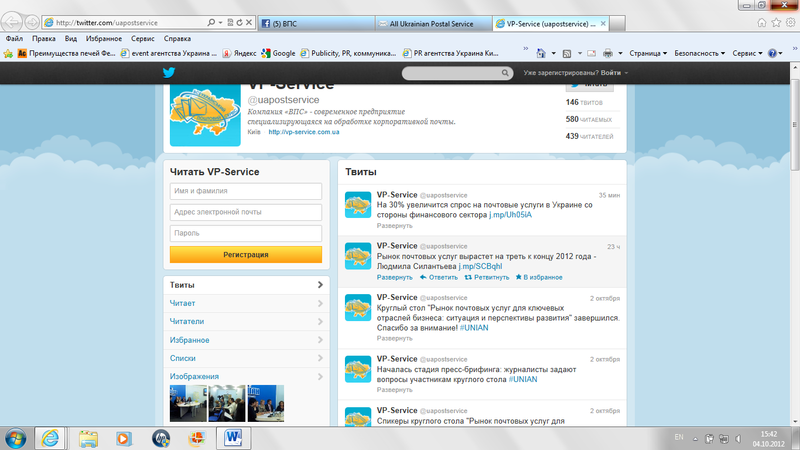 On the VPS Social Network pages from this event the online reports were translated. That’s why Internet Users could be informed with Round Table information during Round Table time.